Consumers have filed new complaints against a Noblesville-based contractor accused of taking people’s money and not finishing the job. 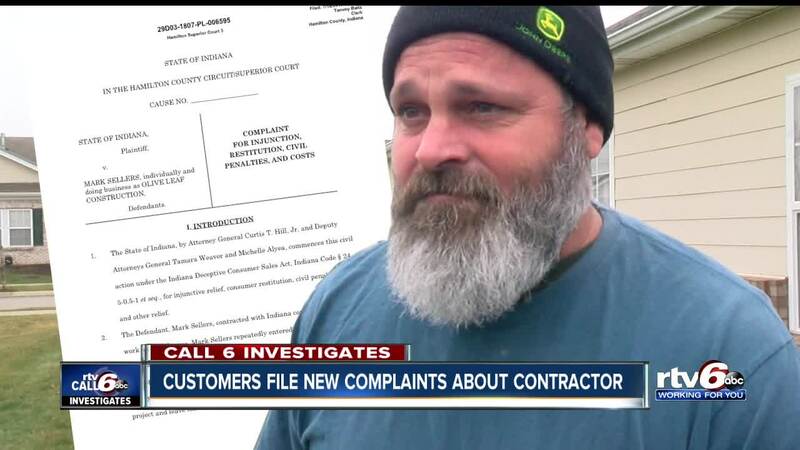 INDIANAPOLIS — Consumers have filed new complaints against a Noblesville-based contractor accused of taking people’s money and not finishing the job. The Attorney General’s office filed a lawsuit against Mark Sellers in July following a Call 6 Investigation into his business practices. The lawsuit, which accuses Sellers of deceptive practices, is still pending in Hamilton County court. As Sellers faces legal troubles, he’s accused of victimizing more consumers in Central Indiana, including Indianapolis and Greenfield, since the Attorney General’s office filed its lawsuit. Call 6 Investigates aired an interview with Sellers back in May in which he said he was working on repaying customers. Sellers’ former customers say they haven’t received any money from Sellers, and now more consumers are coming forward. David Shihadeh rehabs homes for a living, including on the east side of Indianapolis. “There’s a lot of homes in this area that need work,” said Shihadeh. Shihadeh filled out forms online looking for a contractor to do foundation work at a home on Eastern Avenue. Shihadeh said Mark Sellers contacted him in August 2018. “He begged me to do the job,” said Shihadeh. “He said ‘I need the money, and I'm really good at doing what I’m doing.’"
Shihadeh hired Sellers back in August. The address listed for Sellers on the contract is a UPS store on Allisonville Road in Fishers. Shihadeh said Sellers started but did not complete the foundation work. “I’ve tried to work with him to finish the job,” said Shihadeh. Shihadeh said Sellers also left behind damage including a broken water pipe and a mess of debris. “He dumped them all over there, and he was supposed to take this all away,” said Shihadeh as he stood by a pile of blocks. Shihadeh hired Jimmy Brown, a mason of 45 years, to help fix the home on Eastern Avenue. Brown said the job should have been finished within a week. “He did more harm than good,” said Brown. “He doesn't need to be in this business taking people's money man." Indiana Deputy Attorneys General filed the lawsuit against Sellers on July 18 accusing Sellers of violating the Indiana Deceptive Consumer Sales Act and the Indiana Home Improvement Contracts Act. They’re asking the court to stop sellers from operating, and they’re seeking restitution for several Sellers’ customers. Records show Mark Sellers is accused of bad business practices in Colorado as well. The Boulder County District Attorney’s office sued Sellers in 2011 for low-balling customers by underbidding construction projects, mispresenting his masonry work on his website , and for using deceptive trade practices. They obtained a $32,084 judgment against Sellers, but he still has not paid it. Records show Sellers, who does primarily concrete and masonry, has mounting civil judgments in Indiana dating back to 2014 totaling more than $110,000. A dozen people have filed complaints with the Attorney General, including Shihadeh. Call 6 Investigates met up with Sellers in March 2018, and he said he’s working on paying people back. Consumers we talked with say they have not received a dime from Sellers since our story aired in May. David Shihadeh said he paid Sellers $8,000 before he found out about the Call 6 Investigation and the Attorney General lawsuit. He’s right—Mark Sellers does have a valid, active contractor license in Marion County. Indy Department of Business & Neighborhood Services spokesperson Dimitri Kyser said there are various reasons a contractor could be brought before the Board of Contractors regarding their license including fraud or poor workmanship, but they have to have evidence or a willing witness to proceed with a case. The city has received two complaints about Sellers, but one was outside their jurisdiction and the other complainant has yet to provide documentation to the agency. The city issued a stop work order on the Eastern Avenue home on August 31 because no one got a permit for foundation work. “Mr. Sellers researched what was needed to correct the issue 9/11/18 and the structural permit was issued 9/21/18,” said Kyser. However, no one has paid the $215 fee to the city for the violation. David Shihadeh plans to file a police report and his complaint to the Attorney General’s office is still under review. "It's discouraging for me,” said Shihadeh. “I don't even want to deal with contractors anymore because i don't know who to trust anymore." Call 6 Investigates called and emailed Sellers in November about this particular job and we have not yet heard back. His attorney has not yet provided a response to RTV6. Sellers did file a response to the Attorney General’s lawsuit in which he denied many of the allegations and said he couldn’t finish some of the jobs because his customers prevented him from doing so.